Gov. 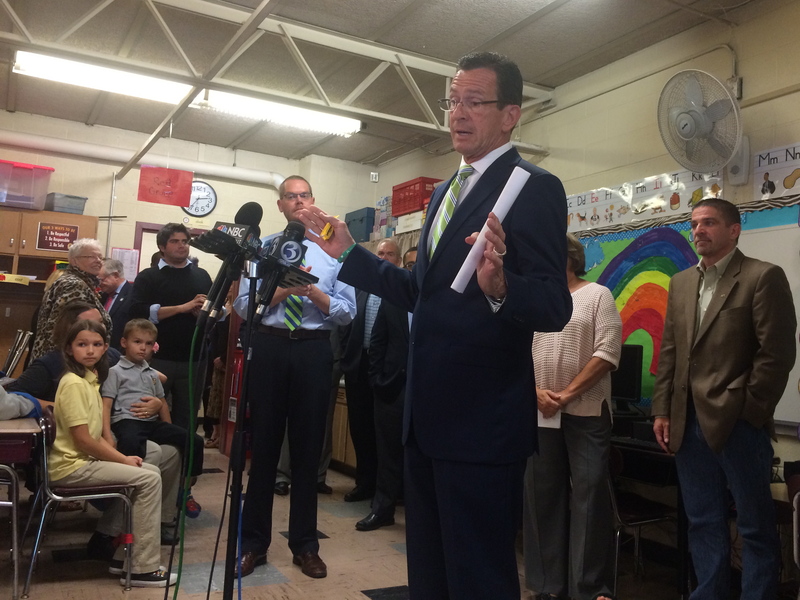 Dannel P. Malloy was joined by educators and union officials in denouncing Tom Foley’s education plan. East Hartford – Gov. Dannel P. Malloy moved quickly Thursday to exploit what Democrats say is an ill-considered and impractical proposal by Republican Tom Foley to allow urban parents to pick the local public school of their choice and strip money from failing schools as their children go elsewhere. Malloy said the education proposals Foley made Wednesday as part of a larger urban agenda show that the Greenwich businessman has no grasp of current education policies and resources, nor does he appreciate how devastating it would be to urban school systems to begin denying funds to schools that need more resources. “You can’t treat a school like a factory. You don’t sell it. You don’t close it. You have an obligation to make it work,” Malloy said. Malloy stood in the classroom of an elementary school in East Hartford, one of 30 chronically struggling systems that are “alliance districts,” eligible for additional state funding to implement improvements authorized by the State Board of Education. The directors of the state’s largest teachers’ union, the Connecticut Education Association, are not making a decision on a gubernatorial endorsement until Friday, but the union sent local and statewide leaders to back the Democratic governor during a press conference at the Robert J. O’Brien STEM Academy. There is no chance the CEA will endorse Foley, but it’s been unclear if the union’s leaders could safely endorse Malloy without angering a significant percentage of its members, who have been dissatisfied with Malloy and his departing education commissioner, Stefan Pryor. Foley’s school choice and “money-follows-the-child” proposals may ease the way. The actual impact of Foley’s plan is harder to gauge, since he has not provided details on how he would enforce a mandate that money follow a child within the same school district. For example, what would force a school board to move funds from one school to another? Could the money be used to finance new charter schools? Foley did not fully explain Wednesday, and his campaign did not respond to questions posed Thursday. Foley’s urban agenda used material taken verbatim from three sources without attribution. Foley also proposed grading every school on an A to F scale without saying what test scores or other metrics would be used. Without pronouncing them failures, the Malloy administration now targets the neediest schools in the “commissioner’s network” for stronger oversight and help. The schools can remake themselves with greater autonomy and flexibility, but face greater accountability. The network now has 11 schools, with authorization for participation by up to 25. Malloy said Foley has yet to understand what the state already is doing.